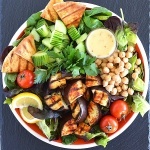 There are so many things to love about this Grilled Eggplant Salad! First of all, it’s quick and easy to put together. It’s also super healthy. I am all about these arranged salads for lunch lately (as you may have noticed). The base of this salad is a sweet & crunchy mix (baby red butter lettuce and spinach), but any mix will do. I love this one because it’s colorful and has some texture to it which holds up nicely to the vegetables. I top with small cucumber wedges (those little lines were created with a zester before cutting). 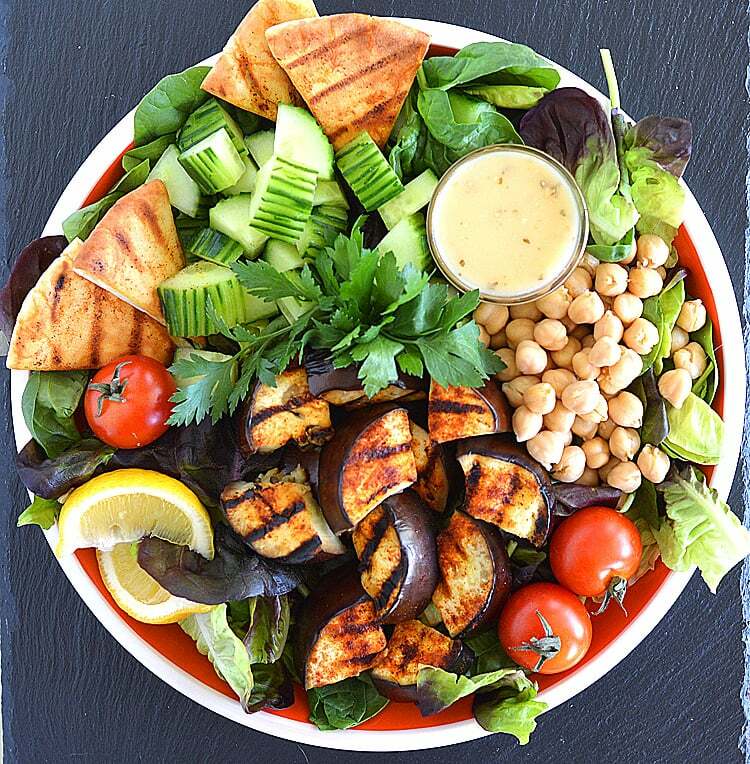 Chickpeas, cherry or Campari tomatoes and lemon wedges frame the star of the show…grilled eggplant. I lightly oil and season the eggplant with paprika, salt, pepper & garlic powder before grilling. Repeat on the other side. Last but not least, I cut up pita bread into triangles, lightly brush with oil & sprinkle with paprika and give one side a quick grill as well. The dressing is up to you. I prepared a light Italian dressing, but if you’d prefer, something like a Tahini dressing would pair nicely with the eggplant. PLEASE NOTE: The dry mix for the dressing will make more than you need for this recipe, but can be stored in a sealed container and used for your next preparation. Tender Salad Mix red butter lettuce, spinach, etc. To make the dressing, in a small bowl, mix together the garlic salt, onion powder, sugar, oregano, pepper, thyme, basil, parsley, celery salt and regular salt. Store in a tightly sealed container. (THIS WILL MAKE MORE THAN YOU NEED FOR THE RECIPE - SAVE IT FOR ANOTHER BATCH OF DRESSING). To prepare dressing, whisk together 1/4 cup white vinegar, 2/3 cup canola oil, 2 tablespoons water and ONLY 2 tablespoons of the dry mix. Arrange the lettuce mix on a large salad plate. Add 1/2 C of chickpeas, 1/2 C or so of cucumber wedges and whole tomatoes. On a hot grill (or grill pan) lightly oil 1" thick slices of eggplant and season with paprika, salt, pepper and garlic powder. Repeat on other side. Be sure to have the grill hot enough, you want those grill marks! Cut the eggplant into wedges. Arrange the eggplant in the center of the plate and garnish with lemon wedges and fresh parsley. Lastly, using the residual heat of the grill, lightly brush the pita with oil and sprinkle with paprika. Grill for just a few minutes. Serve immediately.